Usted no puede ser un santo a medias, tendrá que serlo del todo o no serlo en absoluto. Today’s quote by the Discalced Carmelite, Bishop Silvio José Báez comes thanks to a video from Catholic News Service; we will let our brother in the Teresian Carmel speak for himself. Wednesday 10 April at the archdiocesan chancery offices in Managua, Cardinal Leopoldo Brenes, Archbishop of Managua met with members of the press along with his Auxiliary Bishop, Silvio José Báez, O.C.D. Cardinal Brenes, speaking off the cuff to open the press conference, explained that Bishop Báez would be leaving Nicaragua after Holy Week and Easter to go to Rome for an undetermined period. Báez, a Discalced Carmelite who was teaching in Rome when Pope Benedict XVI nominated him to return to his native Nicaragua as Auxiliary Bishop 9 April 2009, is no stranger to the Holy City. In October 2018 we published the exclusive translation of Bishop Silvio’s tribute to former Nicaraguan president Violetta Chamorro, Meeting With a Mother in Rome. Readers of this Carmelite blog will recognize from our many publications that Bishop Silvio José is a passionate, prophetic voice in Nicaragua who embodies the spirit of the Holy Prophet Elijah, the Guide and Father of Carmelites. Bishop Báez prefaced his remarks by reading at length from the Apostle Paul’s farewell address to the Elders of the Church at Ephesus, where Saint Paul speaks of “serving the Lord with all humility and with tears, enduring the trials that came to me through the plots of the Jews.” [Acts 20:19] A subtle reference is made here by the bishop to a June 2018 plot to assassinate him, along with the United States ambassador Laura Dogù — a foiled plot that recently was revealed by Ambassador Dogù in a university lecture. Bishop Silvio José continued, explaining the reason for this announcement of his departure, which comes on the heels of a seemingly unforeseen trip to the Vatican April 1 – 8, including a private audience with Pope Francis in the Apostolic Palace April 4. 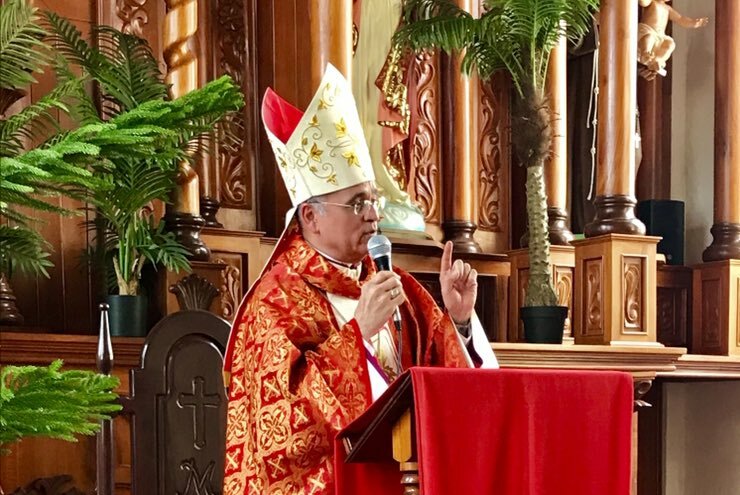 Our thanks to the Nicaraguan daily La Prensa for bringing us these 15 most memorable quotes — truly, Carmelite quotes — from Bishop Báez’s press conference. “I haven’t asked to leave — I’ve been called by the Holy Father”. ROME – Almost a year since a political and social crisis exploded in Nicaragua, the government and opposition forces along with the local Catholic bishops are still trying to figure out how to sit down to work out a negotiated settlement. President Daniel Ortega appears determined to remain in power, as he, together with his wife and Vice President Rosario Murillo, were reelected in 2016 to lead the country until 2021. Yet after a student-led revolt that began in April 2018, both the opposition and the hierarchy of the Catholic Church have called for a series of measures that go from putting an end to violent repression to Ortega calling for early elections. An earlier attempt at dialogue failed last May-June, and efforts recommenced with the new year. Bishop Silvio José Báez, O.C.D. addresses the March 3, 2019 session of the symposium celebrating the 75th anniversary of Religious Life Review (Vida Religiosa) in Madrid, Spain. The topic of his conference was “In Internal and External Conflicts, Mediation and Reconciliation”. Bishop Silvio Jose Baez, auxiliary of Managua, will stay out of the dialogue efforts this time around, at least officially. He rose last year as a strong voice against the Ortega, often going to Twitter to denounce the repression against protesters. He’s currently in Madrid, where he spoke on Sunday at a conference for the 75th anniversary of the magazine [Vida Religiosa]. Regular readers of our blog will recognize the name of Bishop Silvio Baez, our Discalced Carmelite confrere who is the Auxiliary Bishop of Managua. Let us pray for these negotiations in Nicaragua, that true justice and lasting peace may dwell in the hearts and homes of the people. Roberto Zamora, president of the Lafise financial group, is in Madrid on business. He granted an interview to EFE press agency, in which he spoke about the ongoing crisis in Nicaragua, its economic and financial ramifications, and the need for a dialogue. Zamora is one of the five Nicaraguan businessmen who met with OrMu over the weekend. The Catholic Church, represented by Cardinal Brenes and Apostolic Nuncio Somertag, was also present. Dr. Minúscula covers the unfolding drama in Nicaragua from the perspective of an academic and as a native of Nicaragua. We share the professor’s insights to help our readers understand the current events in this nation where Bishop Silvio José Báez, O.C.D. serves as Auxiliary Bishop of the Archdiocese of Managua. Note from Elijah’s Breeze: From time to time we share images and quotes from Bishop Silvio José Báez, O.C.D., the Discalced Carmelite friar who is the Auxiliary Bishop of the Archdiocese of Managua, Nicaragua. Agenzia Fides, Crux, and other Catholic news services continue to report on the unfolding drama in that troubled nation as the Church and Catholic laity are violently oppressed. Blogger Dr. Minuscula offers great insight into the situation, particularly from her academic background as a university professor.